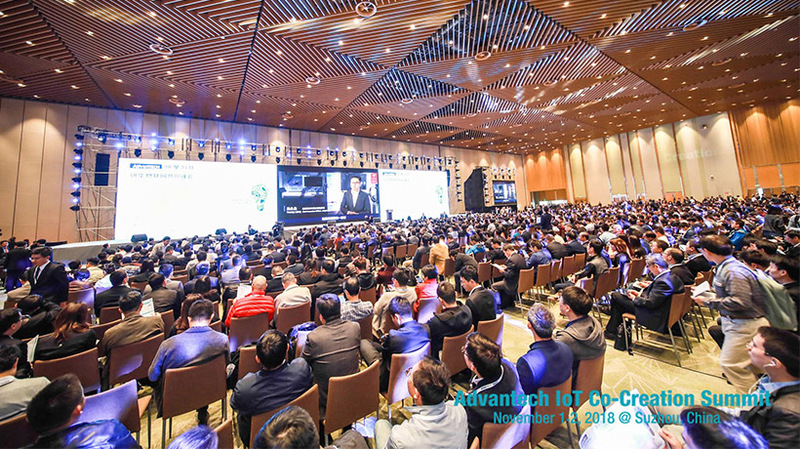 Over 5,000 IoT industry players flew from all over the world to Suzhou to attend a two-day summit on IoT co-creation held by global intelligent system leading company Advantech Technology and witness the features and benefits of the company’s latest IoT platform architecture WISE-PaaS 3.0. The 1st Advantech IoT Co-creation Summit, rounded off on Nov.2, had shared over 30 Solution Ready Packages (SRP) co-created by Advantech with its business partners and customers based on the WISE-PaaS 3.0. One of those revealed cases is an intelligent manufacturing solution co-created by Advantech and Taiwan’s leading tool machine manufacturer Yeong Chin Machinery, which is a SaaS solution tailored for the machinery industry based on Advantech’s hardware and WISE-PaaS platform and Yeong Chin’s accumulative knowhow in its domain area. The machinery SRP allows users to select their own suitable modules to form a solution and introduce the solution into relevant IoT architecture quickly. Another example is an intelligent logistics solution co-created with China’s Techbloom Information Technology based on “featherweight class logistics automation” theory invented by the company, which combines IoT, BI and AI modules to empower existing warehousing facilities with sensing, positioning, recognizing and communicating abilities, allowing users to increase/decrease and interexchange modules in realizing modular logistics automation. GSD has taken deep roots in China’s environmental protection market for years. By establishing an intelligent water treatment platform, GSD is able to instill the value of data into water treatment process. In this case, Advantech provides foundational hardware architecture for data sensing and transmission and push the field data to cloud platform to achieve informational integration. Another partner, iLINE Information Technology, has used Advantech’s hardware and WISE-PaaS platform to predict health status of individual machines. The edge data is acquired and processed with Advantech WISE-PaaS/EdgeLink devices combined with WISE-LoRa wireless gateways in a cable-free deployment environment, then channeled into a big data platform integrating with digital models and machine learning algorithms for implementing precautionary warnings on machine condition. Ewin Information Technology, a total solution provider for Industry 4.0-based smart factory, has provided a SaaS micro-cloud production management solution based on WISE-PaaS IIoT Cloud Platform to help enterprises improve production efficiency and results. Passengera started to provide infotainment and network connectivity solutions to public transportation operators since 2012. Leveraging Advantech’s hardware systems, Passengera delivers complete solution including high speed internet connectivity over multiple LTE-A modems, premium onboard Wi-Fi with dual band functionality and 3x3 MIMO, rich multimedia Infotainment platform and passenger information system, all simply managed by a central management platform. This IoT summit is a critical step for Advantech and its partners marching for the next stage of IoT-based industries. Advantech hopes that this co-creation model will empower global IoT industrial chain, where the WISE-PaaS software platform becomes the very core and kernel for industrial transitions. Starting this year Advantech will initiate more co-creation projects with system integrators in a great variety of industries, working hand in hand with our partners to achieve win-win results.